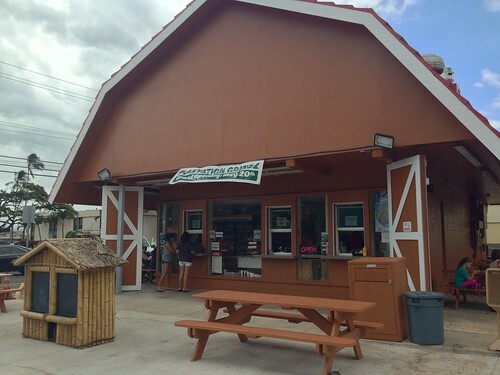 You are here: Home / Food & Drink / Maui Restaurants / Plantation Grindz Opens In Kahului Maui on Lono Ave.
Plantation Grindz Opens In Kahului Maui on Lono Ave. When the Treats & Sweets on Lono closed, it seemed like the end of an era for Kahului dining. 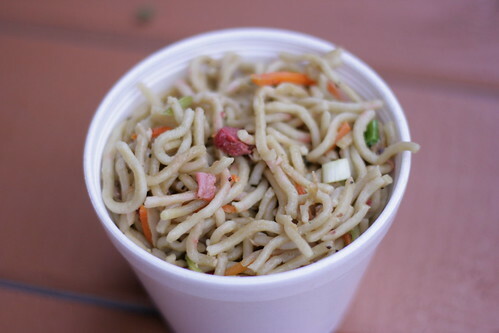 Locals all over the island wondered where will they go for saimin and soft serve. Months later, the renovations in the building are done and the new Plantation Grindz is offering a local plate menu that serves breakfast, lunch and dinner. The building’s renovation leaves it looking like a giant red barn. They really didn’t change much of the old Treats & Sweets exterior, but the fresh red paint and new signs gave the place an upgrade. I was bummed to see the big mango trees gone, mainly because they provided lots of shade. The dining here is outdoors on picnic tables, and it can get pretty hot. The eaves of the barn roof just don’t offer that much shelter. The walk-up counter service menu serves about five prepared daily special hot foods like shoyu chicken, pork and peas, dinardaraan, pinakbet, pork adobo, pork chops, squid luau and fish. The hot foods menu skews towards Filipino favorites. They always have a fried rice and a chow fun and pancit in the hot bar, but the other day I noticed they had run out of chow fun by 12:30pm. The plates are sold by size: one choice of entree is $7.29, two are $8.49 and three are $9.99. Plates come with two scoops white rice and mac salad, but you can sub in fried rice, pancit or other noodle dishes. The pancit and fried rice is ono. 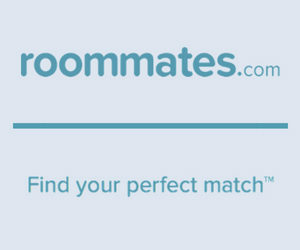 I liked it so much that I brought home sides of both at $4.99 each. I’m not sure what distinguishes their pancit from chow mein–they seemed really similar to me, and both are seasoned dry wheat noodles with julienne carrots, onion, green onion and char siu bits. 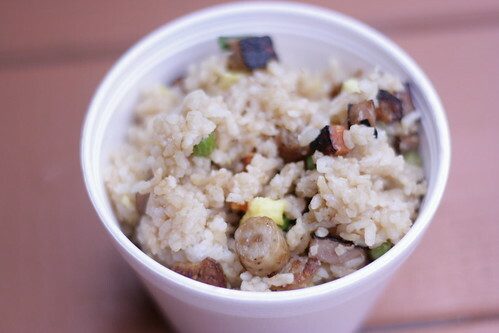 The fried rice brings all the breakfast meats with egg, peas and scrambled eggs into a really flavorful and textured side. They also have a made-to-order menu of kalbi, loco moco, cheeseburger and fries, shrimp tempura, beef steak, chicken katsu, hamburger steak and fried fish. 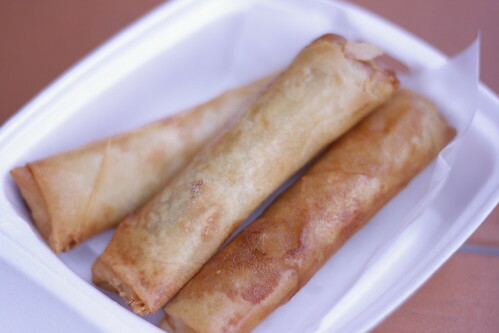 For beverages and desserts they have banana lumpia, halo halo, bubble teas, fountain drinks and canned juices and sodas. I also tried the shrimp tempura, one of the made-to-order dishes, and also the cheeseburger. 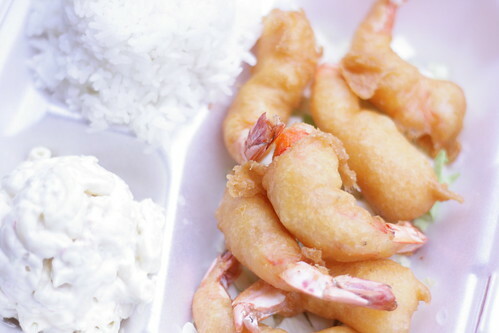 The shrimp tempura was a basic batter-fried shrimp and it came with a thick sweet pink dipping sauce. It reminded me of sweet & sour shrimp. The cheeseburger patties, loco moco and hamburger steaks are all handmade burger patties, and you can get them from breakfast to dinner. 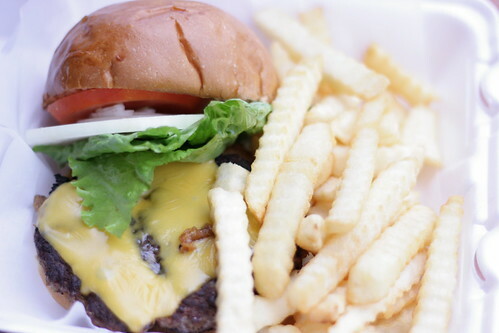 The burger, which comes with cheese, lettuce, onion, tomato and crinkle cut fries, sells for $7.60. The bun is bakery fresh, although the folks at the counter didn’t know where it came from when I asked. Breakfast is simply scrambled eggs with many meat choices–Spam, bacon, breakfast sausage, longanisa or ham–plus your choice of rice. The plate size option applies: one choice of meat is $6.29, two are $7.49 and three are $8.99. The counter opens at 6am and doesn’t switch to lunch until 10:30am. Lunch and dinner are the same menu, which goes to 9pm. For the inside scoop on specials or updates you can try their Facebook page .